Most of us know what it's like to feel isolated, but did you realise that nearly one million parrots regularly go an entire month without speaking to anyone? Here at Feathered Friends we try to alleviate the problem of parrot loneliness through our befriending service. Shockingly, more than half of all parrots kept as pets have nothing but a mirror, a ladder and a little bell for company. Some owners will leave the television on at full blast but this often leads to further distress. Broadcast media is largely unknown in the parrot's natural habitat, wherever that is, and daytime television can lead to confusion, anxiety and a tendency to sign up for short-term loans. In more extreme cases parrots deprived of companionship can suffer wing rot, chapped beak and desaturation. This last condition involves the gradual breakdown of pigments in the birds' colourful plumage, eventually turning them completely black and white. But it doesn't have to be that way. All it takes is a little bit of friendly contact; just someone to spend a few minutes each day exchanging gossip, poking a piece of cuttlefish through the bars or asking them if they're a pretty boy. For parrots like Joey, a three-year-old macaw from Sheffield, that kind of thing can make all the difference. "Squawk squawk squawk," he told us. 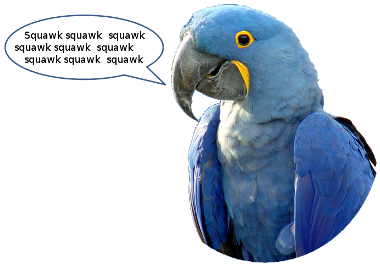 "Squawk squawk squawk squawk squawk squawk squawk squawk squawk squawk squawk squawk." Sobering words, but it's not only Joey who feels that way. This is why every year hundreds of people like you give up their time to help parrots in peril to lead more fulfilled, more secure and more colourful lives. Call now to find out how you can help. The enemy is listening for your flatulence. Watch your emissions. New Discovery Casts Light on Prophet's Death. Replacing your wiring with sausages.